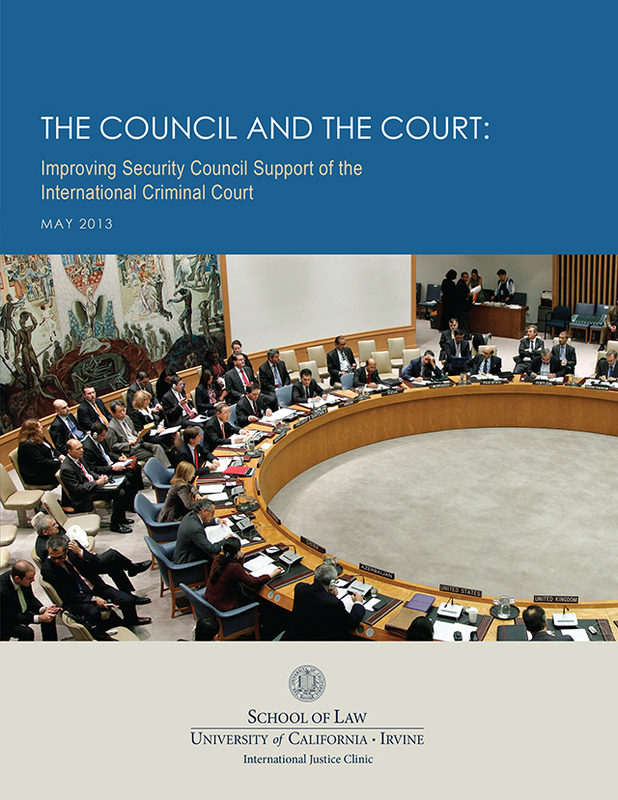 The UC Irvine School of Law International Justice Clinic is pleased to release The Council and the Court, a report designed to answer critical questions about how the UN Security Council may improve its support of the International Criminal Court (ICC): What steps may be taken to convert the rhetorical and political support of the Council to concrete measures supporting Court activities? How may supporters build lasting support for the Court on the Council? How can strong support be developed without compromising the ICC’s independence? What kind of efforts might be helpful to build lasting support in perceived-to-be reluctant capitals, especially Beijing and Moscow? Download the full report here. Download the Executive Summary here. The result of a project supported by Humanity United, and involving a collaboration with the UCLA Burkle Center for International Relations, The Council and the Court explores the relationship between the two institutions and offers proposals to build a sustainable relationship between them, one that is sensitive to the Court’s mandates of accountability and independence and the Council’s mandate of maintaining international peace and security. It addresses factors that animate the Council’s relationship with the Court, highlighting legal, political, and diplomatic dynamics that shape support for the Court on the Security Council. It offers principles that should govern the Council-Court relationship, steps the Council and others may adopt to improve the Council’s support of the Court, and recommendations to engage China and Russia in developing a sustainable relationship between the institutions of security and justice. Dozens of off-the-record interviews conducted in 2012 in New York, Beijing, Moscow, The Hague, and elsewhere underlie this report. Many of its ideas developed during a two-day workshop held in Laguna Beach, California, in November 2012, which brought together diplomats, ICC officials, NGO leaders, and scholars to identify the needs of the Court, the opportunities for cooperation, and the steps that members of the Council could take in support of the ICC. Details of the Laguna Workshop may be found elsewhere on this website. The Security Council’s attention has helped catapult the ICC into the international limelight. The Council called upon the Court to investigate alleged crimes against humanity, war crimes, and genocide in Darfur in 2005 and Libya in 2011. One journalist counted nine references to the ICC in Security Council resolutions in 2012 alone. The Council held an unprecedented public session on the ICC during the fall of 2012, with all participating governments expressing a positive view of the Court. A Court whose charter, the Rome Statute, was only adopted in 1998 and entered into force in 2002, now seems anchored to the Security Council in rhetoric and reality. Moving forward, the task is to render that reality effective for the victims of international crimes everywhere.